With material defect detection, there are various possibilities with a flaw detector to check materials with respect to purity, fault-freeness or load-bearing capacity. A modern flaw detector is used to quickly and reliably check the possible defects and the inhomogeneity of a test piece. The quality of a workpiece is the basic prerequisite for the safety, productivity and success of a company. There are five different ways to inspect a workpiece for its purity, fault-freeness or load-bearing capacity without damage. In the leak test, a distinction is made between vacuum method and overpressure method. If a component is examined for errors only by viewing, one speaks of a visual check. 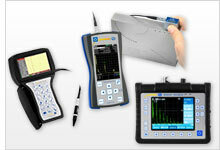 Ultrasonic testing allows a wide range of sources of error to be detected reliably and quickly. Examples of test workpieces are welds, forgings, bars, pipes, tanks and small and large containers. In some areas, testing and maintenance work is difficult or impossible to access due to structural conditions. A flaw detector can detect deficiencies without using electromagnetic waves (EMUS). For materials which are also electrical conductors, the eddy current test can be used as the test method. The conductivity test is most suitable for non-destructive material testing of metals. A flaw detector is an important aid in quality control during the manufacturing process and during the inspection of components during operation, for non-destructive testing and analysis of materials. The aim is to avoid accidents involving personal injury, property damage and environmental damage. PCE-UVL 10 is a rechargeable battery-powered UV light or UV lamp used for the nondestructive testing (NDT) and nondestructive inspection (NDI) of materials and components. Featuring an ingress protection rating of IP66 (meaning the heavy-duty enclosure is dust tight and protected against powerful water jets), this UV lamp allows for the quick and easy detection of material flaws, defects, cracks, faults and damages. PCE-FD 20 is a portable ultrasonic flaw detector with a large LCD screen that displays A-scan maps of ultrasonic signals as well as B-scan cross sections. Ideal for use in mechanical engineering, aerospace and metallurgical applications, this high-frequency ultrasound-based flaw detector uses a contact transducer (two different probes included; 45° and 90°) to measure material thickness and identify flaws and defects such as discontinuity in welds. PCE-USC 20 is a portable or benchtop ultrasonic tester or ultrasonic flaw detector with a 5.7" TFT color LCD screen. This ultrasound-based flaw detector uses one or two contact transducers (four different probes included; 90 °, 70 °, 60 °, 45 °) to measure material or wall thickness, detect flaws or defects in welds, and monitor the effects of corrosion on pipes and tanks. PCE-USC 30 is a flaw detector designed for the non-destructive testing (NDT) and non-destructive evaluation (NDE) of electrically conductive materials. This portable, handheld flaw detector detects surface defects and measures layer thicknesses using an eddy current. The PCE-USC 30 flaw detector also measures metal conductivity in accordance with the International Annealed Copper Standard (IACS).